Andrew Cadie is a musician, producer and tutor. Originally from Northumberland and based in Germany, he is rooted in folk music and covers a wide range of other styles. As a musician, he is a singer and plays fiddle, acoustic and electric guitar, Northumbrian pipes and trumpet. Most of Andrew’s performing and recording is done with the well established duo Broom Bezzums. 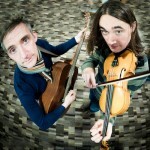 Together with duo-partner Mark Bloomer he tours extensively in Europe and the UK. When time allows, he is in-demand as a session musician for live and studio work – especially where authentic folk fiddle or creative, crossover violin is needed. Having started with various types of sound recording at a very early age, Andrew is also a respected sound engineer and record producer, particularly in the area of acoustic music. Andrew started leading music workshops for Folkworks on Tyneside while at university. He is still regularly asked to offer workshops for ensemble playing, arranging, fiddle and singing. Andrew studied Folk and Traditional Music at Newcastle University from 2001-2005.